NS Design has cleverly designed their instruments with several options for playing, with each instrument benefitting from a number of different support options - some supplied as standard kit, some as additional extras - which dramatically enhance the already extensive range of expression and performance freedom available from every model. NS Double Bass, Cello and Omni Bass models all share a common universal mount that is compatible with a variety of interchangeable stand and strap systems designed to maximise the individual musician's versatility and mobility. 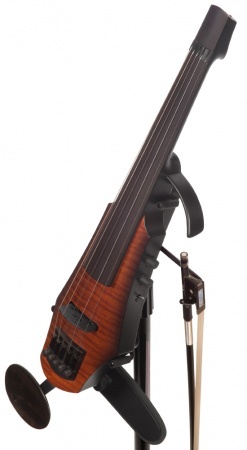 For their violins, NS offers a choice of adaptable shoulder and chin support units, as well as the uniquely practical microphone stand mounted "Violin Caddy". Exclusive to The Bass Centre, the full range of NS Design instruments and accessories - at the best prices in Europe.